Selling tractors, combines, heads & head trailers, planter & tillage equipment, trucks & grain trailers, collector tractors & large amount of other farm equipment. 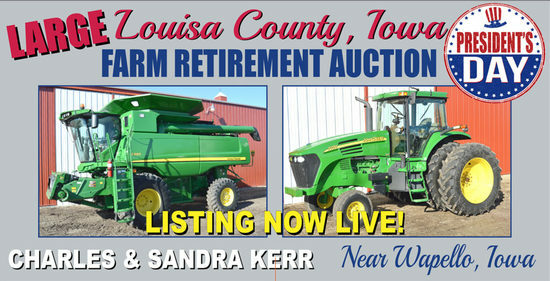 Driving Directions: Machinery to be sold onsite at 16365 110th Street, Wapello, Iowa 52653 (Tract 9). The Kerr Farm is located in Sections 7, 8, 17 & 18, Wapello North Township, Louisa County, IA. In Wapello, IA take Co. Rd. G62 west 2? miles to M Ave. Turn right or north on M Ave. and go 2? miles to the property. You've been outbid to v****s! to YOU! You've been outbid to D****o! to YOU!